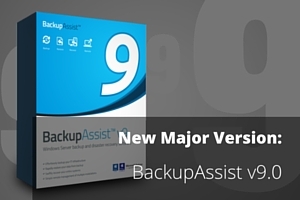 Exciting stuff this morning – the latest major version of the ever-popular BackupAssist has been made live on our site and there’s lots in it to talk about. If your current licence is expired, you have until precisely Midnight tonight to take advantage of our renewals promotion! Thanks so much to all who participated in the beta test phase – we had a great response and it’s been a huge help in ensuring this release is the best it possibly can be. NEW: Hyper-V tab for servers that have the Hyper-V role installed. At a glance, the Hyper-V tab will show you what guests are active, what guests are being backed up and when the last successful backup ran. You can also begin a Hyper-V granular restore or a guest recovery. NEW: Rapid VM Recovery allows you to spin up a single guest from its backup destination to keep critical systems online. This interim solution takes only seconds and provides business continuity until a Full VM Recovery can be performed. NEW: Bootable Backup Media allows you to recover an entire environment from a backup media device. When a bare-metal image backup is stored on an external USB hard disk, you can directly boot into a RecoverAssist environment without the need for a separate recovery disk. NEW: Full VM Recovery provides a dedicated recovery process to fully recover a guest back to the same host or another host. This new feature sits in the Recovery tab alongside the Rapid VM feature to provide a full set of Hyper-V guest recovery features. NEW: Improved performance for faster backups. System Protection backups are up to 30% faster and File Protection backups are up to 40% faster (depending on your replication options and backup destination you use). NEW: Integrated Restore Console for a simpler and more consistent restore experience. You can now locate backups within the BackupAssist user interface, meaning less clicks, and use a customizable filter to specify a date range for the backups that you want to display. 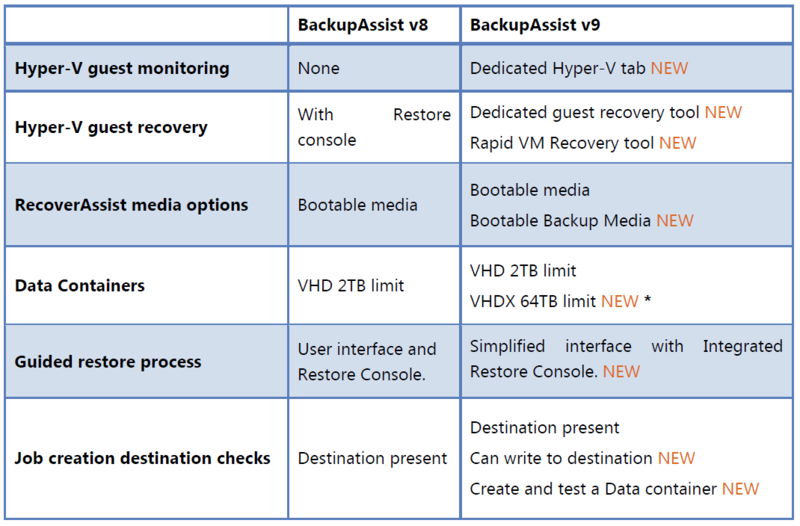 NEW: Streamlined Hyper-V restores. All Hyper-V restores can be performed using the Integrated Restore Console, meaning you do not need to use different tools to restore Hyper-V host files or perform Hyper-V Granular Restores. NEW: VHDX Data containers for Windows Server 2012 R1/R2. This means Data Containers on Windows 2012 R1/R2 servers can support Data Containers of up to 64 TB in size. NEW: On-Demand Analytics allows you to check your backup destination when you create a new backup job. From checking that you have the required permissions for a NAS destination to test mounting a Data Container, On-Demand Analysis will help ensure that you backups run smoothly. NEW: Discover backups is a new feature in the BackupAssist Restore tab that allows you to locate and use backups created by other systems and backups made by jobs that have been deleted. Use the links below to grab the latest version or to view upgrade pricing for your particular licence. *to view any promotional discounts, add your renewal order to the shopping basket. Hope you enjoy the new release – let us know how you get on in the comments section below.